Candida is common, and it’s symptoms are vast. Many have Candida without being aware and yet it’s often misdiagnosed. Candida is a fungus, a type of yeast, in your mouth and intestines. It is normally benign and beneficial in normal amounts. Guess what keeps it in check? Healthy gut flora! Maintaining healthy gut flora is the key to a yeast free system. Your flora does have some Candida in it. When the GI tract gets dysfunctional and out of balance, Candida overgrows. Candida overgrowth can lend some pretty health destroying problems. Bad bugs in the gut can lead to trouble. 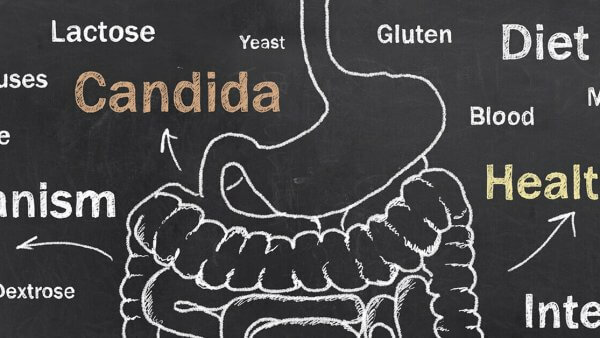 When bad bugs proliferate, Candida runs rampant and creates all sorts of problems including leaky gut and Candidiasis (or “Candida gone wild”). Bad bugs take over after a GI infection, too many drugs, bad nutrition and the like! Like all things in moderation, these bad bugs are usually present in small numbers in the digestive system. However, when the good bugs are hampered – killed by antibiotics, not fed with adequate fiber, or the gut’s delicate ecosystem becomes damaged by too much stress, then the bad bugs take over. What results include many chronic illnesses and symptoms including allergies, chronic inflammation, joint problems, mood and brain disorders as well as digestive symptoms. Candida can be difficult to diagnose. Yeast overgrowth is quite common, but many people don’t know they have it and conventional doctors tend to ignore it. In medical school, we are taught that you either have a disease or you don’t. It’s black and white. However, our bodies weren’t designed with an “on” or “off” switch for disease. All diseases occur in shades of gray, creating a continuum of imbalance along a spectrum of disease. Sadly, many mainstream practitioners ignore patient complaints about subtle problems related to yeast overgrowth. Most assume if a subject isn’t taught in medical school, it doesn’t exist. Medical history proves this is a dangerous assumption. Doctors are not well educated on treating candida. Medical students learn about fungal and yeast problems, but only in a limited way. They know that AIDS patients have severe yeast and fungal infections and need long-term anti-fungal treatment. People with diabetes tend to grow yeast because yeast likes sugar. Babies get thrush and need anti-fungal treatment. Women get vaginal Candida yeast infections. All of these are well-accepted and treatable problems, yet more subtle problems related to yeast are usually ignored and not linked to a patient’s complaints. On the other hand, many alternative practitioners overdiagnose yeast problems. You can see why it can become so confusing. Honestly, we don’t have enough research on this topic. But the collective intelligence of many doctors working in this field for decades with thousands of patients has helped us learn how to appropriately diagnose and treat this often misdiagnosed problem. Use of other drugs like birth control pills, estrogen and steroids (like prednisone). To complicate matters, many tests we use to diagnose yeast problems are neither definitive nor fool proof. Blood antibody levels for yeasts, stool tests and organic acid urine tests for yeast metabolites can be helpful if they come out positive but don’t rule out yeast if they’re negative. Here’s my approach. I often diagnose based a patient’s story, symptoms and physical findings on examination. The best method to diagnose yeast overgrowth is a good history of risk factors like antibiotic use and symptoms of chronic yeast problems and most of all a sugar-carb based diet. It doesn’t take expensive testing! Symptoms of yeast overgrowth vary from person to person and the response to treatments will vary. Some people may need aggressive treatment, while others need only simple changes to make a significant difference in their health. What are Symptoms of Yeast Overgrowth? Address predisposing factors. Don’t take antibiotics, steroids or hormones unless absolutely medically necessary. Too many NSAIDs ruin the gut lining. When the gut is injured, yeast and unhealthy populations of bacteria can overgrow! Change your diet. Eat a diet that doesn’t feed yeast in the gut. This include foods low in sugar and refined carbohydrates, as well as avoiding foods that contain mold and yeast. This means eating this way for a long period of time and sticking to a low-sugar diet indefinitely. Repopulate healthy bacteria. Use probiotics to repopulate the gut with healthy bacteria. Take anti-fungal herbs and medications when indicated. Work with your medical provider to find the best treatment for you! Increase your fiber. Fiber is food for the friendly gut bacteria! Lack of fiber allows unhealthy bacterial strains to grow, especially candida! Reduce stress. Learn how to actively relax. To engage the powerful forces of the mind on the body, you must do something — you can’t just sit there watching television or drinking beer. Yoga, deep breathing, meditation and mindfulness are some of my favorite ways to reduce stress. Stop the madness to stop the disease! Changing an unhealthy lifestyle is key to long term health! It is also key to ridding a system of candida!